Happy Teacher Appreciation Week! Whether you’re a teacher or your kids give teachers not so easy days, here’s some places giving away freebies and deals to thank a teacher this week! CAFE BRAZIL: Teachers enjoy 20% off their bill year round with a valid teacher ID. CHICK-FIL-A: Deals vary by location! Check your nearest location for what they’re offering this week. CHIPOTLE: Buy one, get one free burritos, bowls, salads or tacos on Tuesday, May 8, starting at 3p. 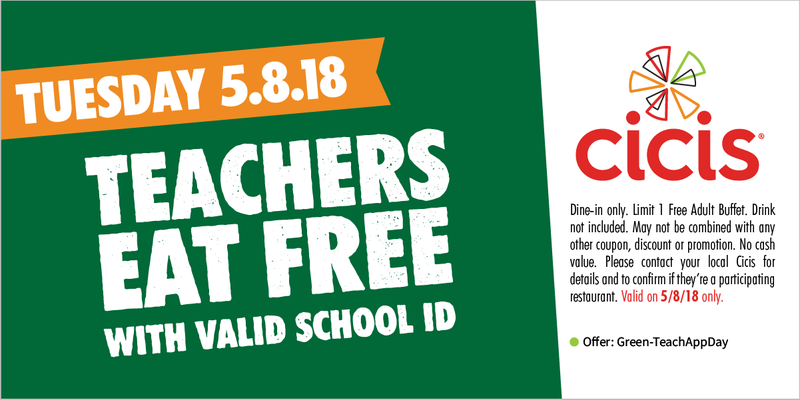 CHILI’S: Teachers get 15% off on May 7-11 at participating locations. CICI’S PIZZA: FREE adult buffet on Tuesday, May 8, with valid teacher ID and coupon. EINSTEIN BROS BAGELS: Get 20% off any purchase with promo code 9053 on May 7-11. EL FENIX: Get 15% off May 7-11. GRIMALDI’S: Get 15% off May 7-11. KRAVE CEDAR HILL: FREE breakfast sandwich with a $3 or more purchase. HAAGEN-DAZS: FREE ice cream cone on May 8 at participating locations from 4-8p. RAISING CANES: Teachers and faculty receive a free box combo with a valid ID on May 8 from 6-9p. HALF PRICE BOOKS: Teachers save 10% year round in store. J. CREW: 15% off year round for teachers and students with valid ID. LOFT: Teachers get deals year round with their Loft Loves Teachers program. MICHAEL’S CRAFT STORE: 15% for teachers when you sign up in store. JOANN FABRICS AND CRAFTS: 15% off on every purchase for teacher with their discount program. PARTY CITY: 20% discount for teachers year round. REUNION TOWER TEACHER APPRECIATION NIGHT: Teacher Appreciation Night at Reunion Tower on May 17. FREE admission for teachers, past and future educators.